The rock was a symbol of Christ, and by it the most precious spiritual truths are taught. The Saviour made use of this symbolic service to direct the minds of the people to the blessings that He had come to bring them. "In the last day, that great day of the feast," His voice was heard in tones that rang through the temple courts, "If any man thirst, let him come unto Me, and drink. He that believeth on Me, as the Scripture hath said, out of his belly shall flow rivers of living water." "This," said John, "spake He of the Spirit, which they that believe on Him should receive." John 7:37-39. The refreshing water, welling up in a parched and barren land, causing the desert place to blossom, and flowing out to give life to the perishing, is an emblem of the divine grace which Christ alone can bestow, and which is as the living water, purifying, refreshing, and invigorating the soul. He in whom Christ is abiding has within him a never-failing fountain of grace and strength. Jesus cheers the life and brightens the path of all who truly seek Him. His love, received into the heart, will spring up in good works unto eternal life. And not only does it bless the soul in which it springs, but the living stream will flow out in words and deeds of righteousness, to refresh the thirsting around him. The same figure Christ had employed in His conversation with the woman of Samaria at Jacob's well: "Whosoever drinketh of the water that I shall give him shall never thirst; but the [p. 413] water that I shall give him shall be in him a well of water springing up into everlasting life." John 4:14. Christ combines the two types. He is the rock, He is the living water. The same beautiful and expressive figures are carried throughout the Bible. Centuries before the advent of Christ, Moses pointed to Him as the rock of Israel's salvation (Deuteronomy 32:15); the psalmist sang of Him as "my Redeemer," "the rock of my strength," "the rock that is higher than I," "a rock of habitation," "rock of my heart," "rock of my refuge." In David's song His grace is pictured also as the cool, "still waters," amid green pastures, beside which the heavenly Shepherd leads His flock. Again, "Thou shalt make them," he says, "drink of the river of Thy pleasures. For with Thee is the fountain of life." Psalms 19:14; 62:7; 61:2; 71:3. (margin); 73:26 (margin); 94:22; 23:2; 36:8, 9. And the wise man declares, "The wellspring of wisdom [is] as a flowing brook." Proverbs 18:4. To Jeremiah, Christ is "the fountain of living waters;" to Zechariah, "a fountain opened . . . for sin and for uncleanness." Jeremiah 2:13; Zechariah 13:1. Isaiah describes Him as the "rock of ages," and "the shadow of a great rock in a weary land." Isaiah 26:4. (margin); 32:2. And he records the precious promise, bringing vividly to mind the living stream that flowed for Israel: "When the poor and needy seek water, and there is none, and their tongue faileth for thirst, I the Lord will hear them, I the God of Israel will not forsake them." "I will pour water upon him that is thirsty, and floods upon the dry ground;" "in the wilderness shall waters break out, and streams in the desert." The invitation is given, "Ho, every one that thirsteth, come ye to the waters." Isaiah 41:17; 44:3; 35:6; 55:1. And in the closing pages of the Sacred Word this invitation is echoed. The river of the water of life, "clear as crystal," proceeds from the throne of God and the Lamb; and the gracious call is ringing down through the ages, "Whosoever will, let him take the water of life freely." Revelation 22:17. They were now in sight of the hills of Canaan. A few days' [p. 414] march would bring them to the borders of the Promised Land. They were but a little distance from Edom, which belonged to the descendants of Esau, and through which lay the appointed route to Canaan. The direction had been given to Moses, "Turn you northward. And command thou the people, saying, Ye are to pass through the coast of your brethren the children of Esau, which dwell in Seir; and they shall be afraid of you. . . . Ye shall buy meat of them for money, that ye may eat; and ye shall also buy water of them for money, that ye may drink." Deuteronomy 2:3-6. These directions should have been sufficient to explain why their supply of water had been cut off; they were about to pass through a well-watered, fertile country, in a direct course to the land of Canaan. God had promised them an unmolested passage through Edom, and an opportunity to purchase food, and also water sufficient to supply the host. The cessation of the miraculous flow of water should therefore have been a cause of rejoicing, a token that the wilderness wandering was ended. Had they not been blinded by their unbelief, they would have understood this. But that which should have been an evidence of the fulfillment of God's promise was made the occasion of doubt and murmuring. The people seemed to have given up all hope that God would bring them into possession of Canaan, and they clamored for the blessings of the wilderness. Their cries were directed against Moses and Aaron: "Why have ye brought up the congregation of the Lord into this wilderness, that we and our cattle should die there? And wherefore have ye made us to come up out of Egypt, to bring us in unto [p. 417] this evil place? it is no place of seed, or of figs, or of vines, or of pomegranates; neither is there any water to drink." 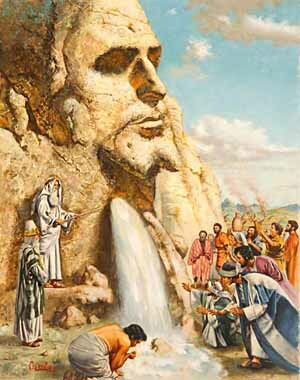 Moses manifested distrust of God. "Shall we bring water?" he questioned, as if the Lord would not do what He promised. "Ye believed Me not," the Lord declared to the two brothers, "to sanctify Me in the eyes of the children of Israel." At the time when the water failed, their own faith in the fulfillment of God's promise had been shaken by the murmuring and rebellion of the people. The first generation had been condemned to perish [p. 418] in the wilderness because of their unbelief, yet the same spirit appeared in their children. Would these also fail of receiving the promise? Wearied and disheartened, Moses and Aaron had made no effort to stem the current of popular feeling. Had they themselves manifested unwavering faith in God, they might have set the matter before the people in such a light as would have enabled them to bear this test. By prompt, decisive exercise of the authority vested in them as magistrates, they might have quelled the murmuring. It was their duty to put forth every effort in their power to bring about a better state of things before asking God to do the work for them. Had the murmuring at Kadesh been promptly checked, what a train of evil might have been prevented! God did not on this occasion pronounce judgments upon those whose wicked course had so provoked Moses and Aaron. All the reproof fell upon the leaders. Those who stood as God's representatives had not honored Him. Moses and Aaron had felt themselves aggrieved, losing sight of the fact that the murmuring of the people was not against them but against God. It was by [p. 419] looking to themselves, appealing to their own sympathies, that they unconsciously fell into sin, and failed to set before the people their great guilt before God. Click here to read the next chapter: "The Journey Around Edom"